BAS Expansion Joints (NZ) is fortunate to represent in the AS/NZ territory, the worlds leading Base Isolation Bearing manufacturer, QuakeSafe Technologies™. The function of this representation is interfaced with TechStar Inc. allowing us to have absolute confidence in the procurement process. As TechStar Inc. have native English speaking Management on the ground in China (who are also proficient in speaking Mandarin), this allows us to be in a unique position to tap into the enormous wealth of experience and technical understanding of how to design Base Isolation Systems and proven seismic upgrade methods. 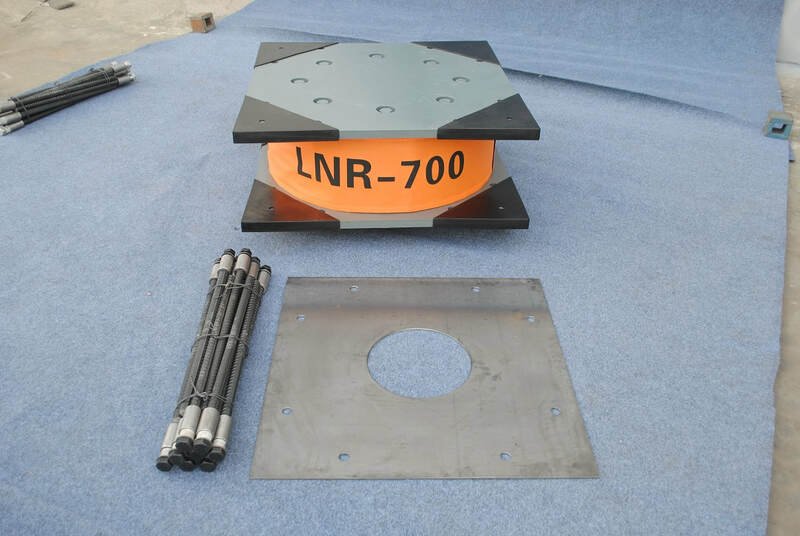 A key component to this technology is a product called a "Lead Core Rubber Bearing" (LRB). This unique system was actually designed by a New Zealander, the late Dr Bill Robertson back in 1975. Since then, this design principle has been the base of further development throughout the world, including in China where QuakeSafe Technologies™ operate from. The basic principle of this design is quite simple, and this is part of the beauty of it. Essentially, the rubber laminated with steel shims (repeatedly depending on the project requirement), allows the vertical loads to be very high (the weight of the building), all the while allowing the rubber to be elastic in the horizontal plane (catering for the 'shaking' of the earth). 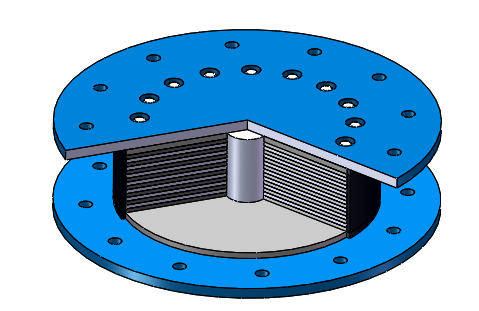 To control or 'dampen' this dynamic load, the core of the bearings are filled with Lead. The unique characteristics of this metal, combined with the steel shims and rubber laminates, creates a very effective 'shock absorption' system that can be reused time and time again. This technology is well reported to be extremely effective and has proven itself over again worldwide. QuakeSafe Technologies™ have recently completed the worlds largest single supply of base isolation bearings for a project. 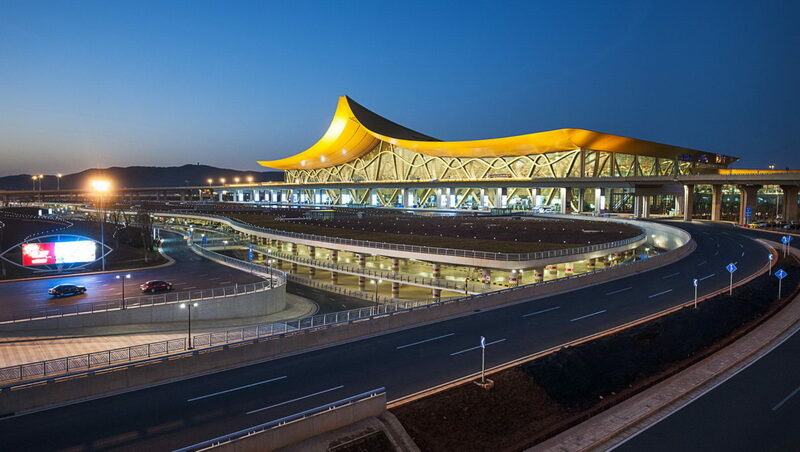 The project was the terminal of Kunming Changshui International Airport which covers an area of 548,000m² with the tallest point being 72.25m. This structure has 3 stories above ground level and 3 stories below. The main body of its concrete structure has a total of 1810 1000mm-diameter QuakeSafe Industries™ elastomeric rubber isolators supporting it! This project alone generated nearly 10 patents, showing the innovative approach QuakeSafe Technologies™ take with projects. At BAS Expansion Joints (NZ) we involve ourselves in the New Zealand , Australian and Pacific region with a holistic, collaborative approach. We understand there is limited benefit for a client to simply partner with us based on pricing alone. We prefer to be fully involved in the construction process, from design, testing, procurement, shipping, delivery, and installation of our technical products such as Base Isolation products. When it comes to added value, we believe we have the best advantage over our competitors due to this depth of support. Because of local expert representation throughout NZ, combined with TechStar / QuakeSafe professional engineers and account managers committing to ensure we have personal access to their expertise right here at ground zero, you are able to have complete confidence that you will receive professional outcomes in any project you choose to partner with us on. NOTE: These products (many not shown here) are very technical and require consultation at the design phase of construction. Please contact us on 0800 SPAN-IT or via email marcus@expansion-joint.co.nz to engage our assistance.